It’s the time of year when you’re busy cleaning out your closets, garages and any other areas that have collected clutter throughout the past year. Yard sales are popping up on every street corner, and unfortunately you’ve joined the masses when it comes to being suckered into the idea that you’re actually going to make a pretty penny selling all your junk this year. After perusing through your closet space you find plenty of clothes garage sale worthy, but what about all your leftover hangers? Lets face it, your dry cleaner has provided you with a plethora of wire hangers with absolutely no space to store them. The quick and easy solution would be to pitch them all out with your yard sale rejects, but what about making some extra pennies by taking them to the scrap yard? Yes, scrap your wire hangers! Upstate Metal Recycling in Fort Wayne, Indiana would be happy to take your hangers…and all the other scrap including metal, copper, steel, e-waste and even your junk cars! The bonus with Upstate is if your load is too heavy, they’ll pick it up free of charge! Granted, it’s safe to say you won’t get rich off of the wire hanger recycling business, but at least you’ll be helping the environment at the same time. You may think that throwing away one measly wire hanger fails to be a big issue in our landfills…but those hangers add up. 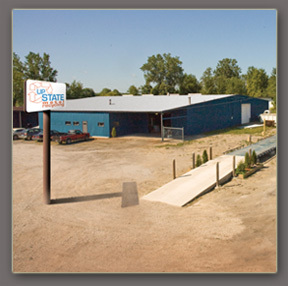 Stop in, call or visit Upstates website. You won’t be disappointed! Scrapping Your Car for Cash! Spring time is a great time to purchase a new car! Did you know there’s another alternative to trading your car into the dealership for a new ride? Scrapping your vehicle can bring you big bucks! Marty Henry at Upstate Metal Recycling in Fort Wayne, Indiana wants to make departing with your car as easy as possible. At Upstate, we are very straight forward and honest with our pricing for vehicles. We do not inflate our prices to sound better than the other yards around town. We offer fair market value for your vehicle and we offer Free Towing to our yard on Bluffton Road. You can rest assured that once you have done business with Upstate Metal Recycling, that you will be satisfied with the Honesty we provide. Check out our behind the scenes video of our commercial shoot!